Is there anything better than wine and cheese? We don’t think so! 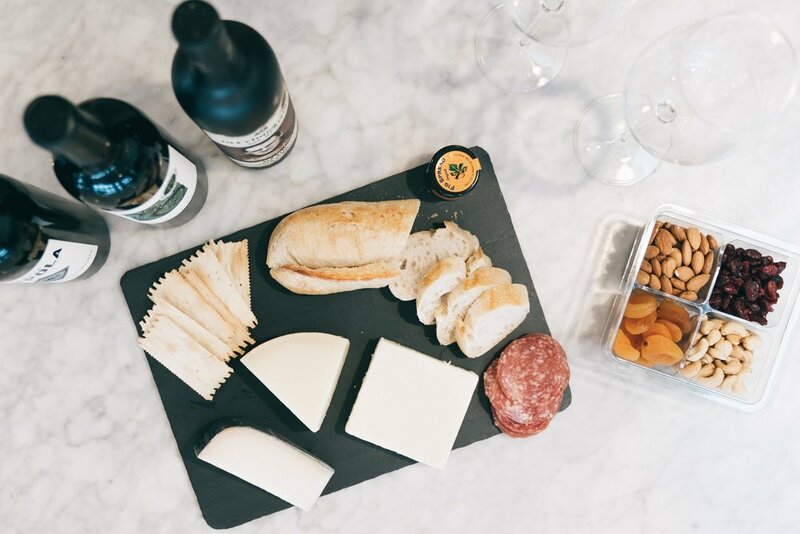 We love putting together charcuterie and pairing it with our favorite wines. But when it comes to entertaining, this can quickly add up. Entertaining doesn’t have to break the bank. There are some excellent budget wines and quality cheese that pair wonderfully and taste delicious. We have put together a few of our favorites so that the next time you entertain, all you have to do is print out the list and go to your local grocery store. Most grocery stores also carry pre-packaged nuts and dried fruits. You can typically find these “pairing packs” in the specialty cheese kiosks at stores like QFC, Safeway, and Hagen. The one we picked up cost under $7.99 and included dried apricots, almonds, cashews, and cranberries. Other additions to your charcuterie board can include salami, olives, and fig jam. These also are easily found at the cheese kiosks. Don’t forget the crackers! You can’t go wrong with these two! Flavor and intensity are amazing. The cab has flavors of plum, black cherry, anise & clove. This Dutch classic aged goat gouda is dense and creamy with a long sweet caramelized finish. This wine was one of our favorites. It’s a Washington state red blend and ranks in the top 3% of wines from the Columbia Valley. It has some rich dark notes of blackberry and dark cherry with a super smooth finish. The cheese we paired this with is called, Esquirrou (ehs-Keer-oo). It’s a cheese from France and is made with sheep’s milk. It has a smooth, elastic texture with a nutty sweetness. This was the 2018 grand prize winner at the world cheese championships. You’ve got to try this one! With aromas of warm vanilla and caramel up front and blackberry jam, plum, and spice on the finish, this bottle is an absolute go-to for inexpensive red wine. The cheese we put with this one is Montamore Cheddar. It’s a sharp white cheddar blended with a moderate parmesan for a super delicious cheese blend! Do you ever get to that point where you feel a lack of creativity in the kitchen? There’s nothing like sharing recipes to put an end ho-hum meal boredom! Last week we asked you to send in your favorite go-to recipes and WOW, what fun that was! For everyone that submitted a recipe, we put your name in a drawing for $100 shopping spree to Whole Foods Market. We are thrilled to announce that Terri DiMartino won! 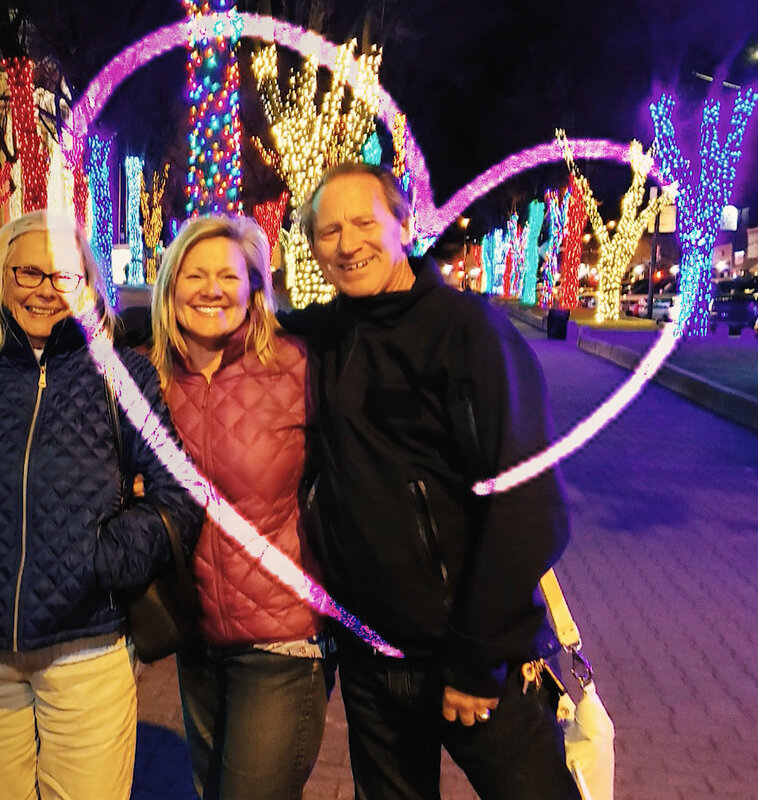 Terri sold her Des Moines home with us a few years ago and we have enjoyed hearing about her and her husband, Pete, in their new ventures since they recently retired. Terri submitted this super easy salad recipe that comes together in just a few minutes. She calls it her anniversary salad because they just celebrated their 9-year anniversary and they make this salad a few times a week. We can understand why! This salad adds a twist to your everyday salad and the variety of flavors make it anything but boring! We especially loved that all the ingredients are winter-friendly, so even when produce is hard to come by in the coldest months, this salad will be an easy one to make! Terri says that the best part of this salad is that all the ingredients can be purchased at Costco, a fave shopping place for them. But really, all these ingredients are easy to find at any basic grocery store, so we love that too. Just throw all the ingredients into a bowl, toss, then serve! The only work to this salad is cooking the chicken breast. If you like to meal prep on the weekend, we found that it was super easy to bake, grill, or sauté a few chicken breasts ahead of time. Chop them up, put them in a storage container and VOILA! This salad pretty much comes together in 10 min or less. If you don’t have time to toast the pecans, they taste great raw, too! We didn’t find the Walden Farms Lite Raspberry Vinaigrette at the grocery store we went to, but we used Marie’s instead. Pretty much any raspberry vinaigrette should do. Have fun with the chicken. Salt and pepper are just fine. But we threw some other herbs on it while cooking and it added an element of flavor. Grilling would also be extra tasty! Another thing we loved about the salad is the color. With the orange, cranberry, and bright greens, this salad is like a gem show! It’s absolutely gorgeous and will add sparkle to your dining room table… that is if you can wait long enough to dig in! Confession time! After we filmed the video for this salad, we all grabbed forks, stood around the bowl, and went to town eating it right out of the communal salad bowl. It was THAT GOOD! We hope you are inspired to try this at home. Let us know if you do in the comments below! One of our favorite things about this autumn/winter season is spending time with friends and family through the beautiful art of cooking. There is just something special about these shorter days! We enjoy warm summer Seattle evenings, but autumn and winter are really the seasons where we love to spend cozy nights cooking at home. Preparing hearty fall meals — even if cooking isn’t your specialty — is an amazing way to gather the ones you love together. Your home should be a place that fills you up, nourishes you, and brings you closer to the people you love. And you know what they say — “the kitchen is the heart of the home!” We hope you all take time this season to slow down and enjoy longer evenings over home-cooked meals with your family and friends. This is my all-time favorite food blog of them moment. If you love tender, fall-off-the bone ribs with a harvest, autumn twist, this recipe is for you! We are all about these delicious hearty ingredients and fun pop of cranberry! If you haven't already fallen in love with Half Baked Harvest, head over to her amazing website and check out all of her delicious recipes! Season the short ribs with salt and pepper. Heat the olive oil in a large oven safe skillet, sear the ribs on both sides. Remove the ribs and transfer to the slow cooker. To the slow cooker, add the onions, shallots, and carrots. Add the wine, broth, tomato paste, brown sugar, thyme, rosemary, and bay leaves. Season with salt and pepper, gently stir to combine. Cover and cook on low for 6-8 hours. During the last 2 hours of cooking, add the cranberries. 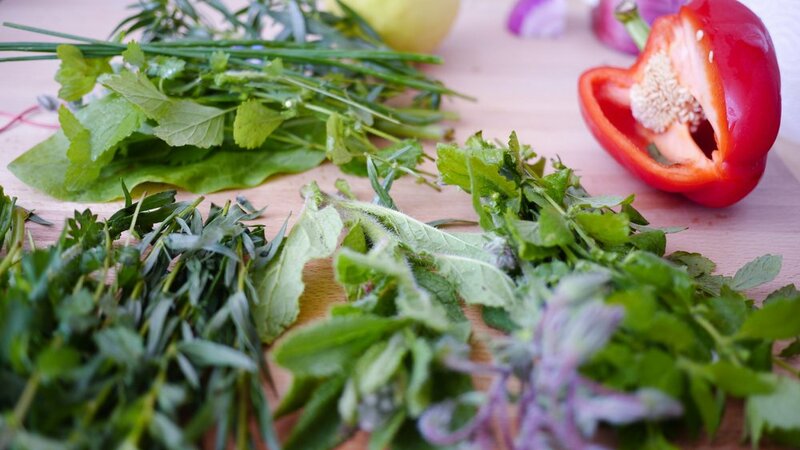 Remove the thyme, rosemary, and bay leaves. Serve the ribs over a bed of mashed potatoes. Drizzle with the pan sauce. Enjoy! Season the short ribs with salt and pepper. Heat the olive oil in a large oven safe skillet, sear the ribs on both sides. Remove the ribs to a plate. Add the onions, shallots, and carrots, cook 5-10 minutes or until the onions begin to caramelize. Add back the short ribs. Add the wine, broth, tomato paste, brown sugar, thyme, rosemary, and bay leaves. Sprinkle over the cranberries. Season with salt and pepper, gently stir to combine. Cover and transfer to the oven. Cook for 2 ½ to 3 hours or until the short ribs are tender and falling off the bone. We are huge pasta fans! Sure a great red or cream sauce is great, but adding in delicious flavors like butternut squash really makes traditional pasta feel like a cozy fall meal. This easy recipe will have your family and friends swooning! Add 1 cup of butternut squash puree, 1 cup of half and half, 1/4 teaspoon of nutmeg, a pinch of paprika, and 1/4 teaspoon salt to the large skillet, on medium heat. While heating, stir all the ingredients to combine. Add about 1/4 teaspoon of lemon pepper seasoning - don't add all of it at once, add a little and add more, to your taste. Add the spinach on top of the mixture, cover with the lid, remove from heat. Let the spinach wilt in the pan, covered, off heat. While the spinach wilts, bring the medium pan of water to boil, add 2 cups of uncooked tortellini, and cook according to the package instructions (usually 7 - 10 minutes in boiling water). Once the tortellini is cooked, drain the water. Add cooked and drained tortellini to the skillet with the butternut squash sauce and spinach and stir to combine. If the sauce is too thick, add more half and half to thin it. Also, taste and add more salt, nutmeg and lemon pepper, if desired. All of your ingredients in one single dish so you only have that one pan to clean?! Sign us up! We LOVE one pan meals. This creamy and hearty chicken and potato dish is a fantastic fall dinner staple. Season chicken thighs with 1 teaspoon Italian seasoning, salt and pepper, to taste. Melt 1 tablespoon butter in a large skillet or pot over medium-high heat. Add chicken thighs, skin-side down, and sear both sides until golden brown, about 4-5 minutes per side; drain excess fat and set aside in a plate. Melt remaining tablespoon butter in the same skillet. Add garlic, paprika, 1 teaspoon Italian seasoning, then add potatoes and saute for 2 to 3 minutes. Stir in tomato and chicken broth and simmer for 4 to 5 minutes. Stir in and half-half, grated Parmesan cheese, spinach and crushed chili pepper flakes. Reduce heat to simmer for 2 to 3 minutes. Return chicken thighs to the skillet, skin side up, and simmer for 10-15 minutes, until chicken and potatoes are cooked through. Adjust seasoning with salt and pepper. Serve immediately with additional red pepper flakes and parmesan, enjoy! The name, Autumn Pumpkin Apple Stew says it all. We love this delicious, plant based dish! Adding apple to a stew may sound odd, but trust us, you’ll love these autumn flavors, and a cozy stew is the perfect fall weekday meal! Don’t let the sound of making home made gnocchi intimidate you! We love this easy, 20 minute pasta recipe! This dish is sure to impress your guests with is delicious fall flavors and beautiful presentation! With all of these amazing hearty meals, a lighter fall salad can be so refreshing! We love that this healthy dish still includes so many fun fall elements like delicata squash, farro, and pomegranate! This dish is great for busy weeknights when you’re looking for quick and healthy alternative to heavy fall dishes! Toss delicata squash in 2 tablespoons olive oil, salt, pepper and chili powder, arrange in a single layer on a lined baking sheet, Roast for about 15 minutes, or until golden and tender. Set aside. In a large bowl,add kale, delicata squash, farro, goat cheese and pomegranate arils. Pour dressing over and toss to fully coat everything in the dressing. This hearty and healthy dish is a great alternative to meat heavy dishes! Chickpeas are a fantastic source of protein, and mixing chickpeas with maple tahini?! YUM! We are loving this unique dish full of flavors we are loving this season! A good friend texted me this recipe and gushed about how amazing it was. It’s simple, fast, and delicious! She swapped out the chicken breasts for chicken thighs and also added more mushrooms. I have this on my dinner menu this week. Loving this season of delicious produce as much as we are? Check out our blog post all about supporting local farmers and enjoying amazing fresh fruits and vegetables! Happy cooking, everyone! Shorter days and earlier evenings fill me with a sense of coziness. It’s the time of the year that spending more time in the kitchen and gathering around the table with friends and family is pure, simple joy. Life slows down, conversations linger, and warmth envelopes the soul. When I married Kevin 22 year ago, I knew little to nothing about cooking. It wasn’t something I enjoyed and when you tasted a meal I prepared, you could tell. But I slowly began to fall in love with spending time in the kitchen. Eventually, the kitchen transformed from a space that represented work, cleaning, and chores to a sense of family, gathering, and love. With that transformation I also began to love the process of preparing a meal. 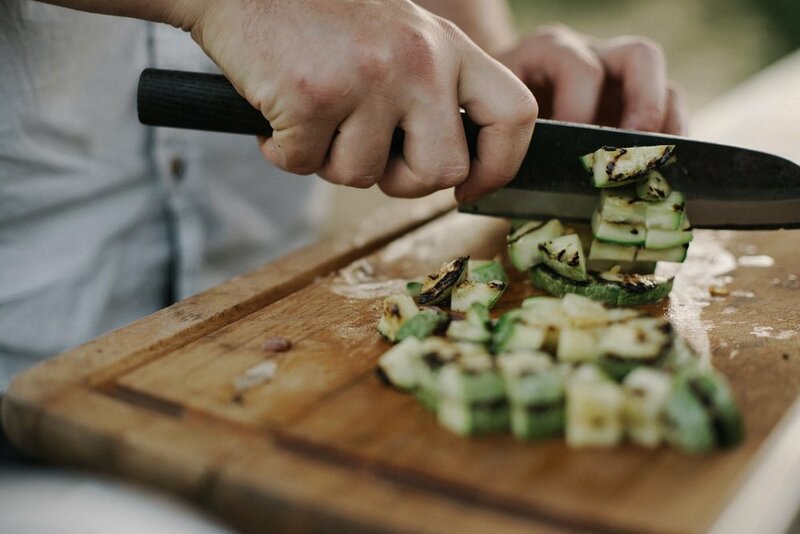 To take some time in the evening to carefully prepare fresh produce and transform it into a tasty and nourishing meal, all while having gentle conversation with my family, gave me a sense of accomplishment and drew our family closer together. While cooking may never be your thing, I’d highly recommend taking time to prepare at least one home-cooked meal a week and enjoying it around your table with the ones you love. Homes are our haven. They are places that should refresh and draw us closer together. The kitchen in my home has done that for me and it’s now one of my favorite places to be. Now that I love cooking, I have also become aware of how important it is to use fresh, local, and seasonal ingredients. This not only makes the food we eat more tasty, but it also helps to support our local farmers and community. A easy and fun way to do this is to join a CSA (community supported agriculture). When you join one, you are essentially buying a farm share from a local farm or a group of farmers. This helps the farmers to have operating capital and in return, you get a delivery of the freshest produce (and sometimes meat, dairy, and more) delivered to your doorstep. So, how does a CSA work? In this area, there are a variety of CSA’s that can cater to your needs. Typically, you pay in advance of the growing season so farmers have operating capital. During the growing season, members receive a box of produce from the CSA on a regular schedule (usually once per week). Some CSA shares are delivered directly to your home, and others must be picked up from a designated location during a set time frame. Some CSAs only offer produce, while others you may also have the option of purchasing a share that includes eggs, meat, dairy, baked goods, fresh flowers, or other farm products. Most CSA’s have pre-selected items that go in the box—produce that is in season and just picked—while others allow you to pick and choose what’s in your box. I have been a member of Full Circle Farms CSA for a number of years. You can pay weekly for your upcoming share and you can get meat, dairy, baked goods, and a number of other products in your weekly delivery. You can also change the produce selection each week if you aren’t fond of the current selection. Since it’s so flexible, this works really well for me but it’s equally fun to support the smaller farms and receive surprise ingredients that add to your cooking repertoire! No two farms do CSA the same way so it’s great to shop around for one that you feel good about supporting and works for your family. To help find the right program for you, we have put a list together of some of the local CSA’s to select from. I hope you find this helpful and that it sparks your interest to consider joining a CSA, too! Remember, you’ll be supporting our local community and the hard-working farmers that are vested in it. Isn’t that worth consideration? 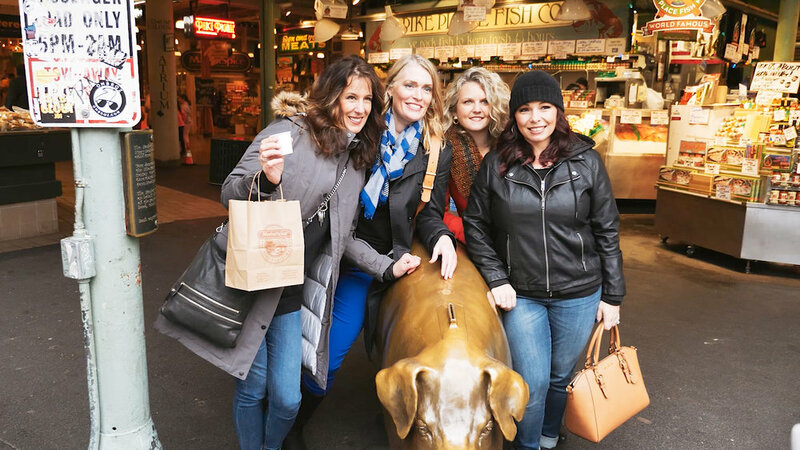 Shopping completely organic and healthy can be easy in Seattle, but when it comes to finding locations in South King County, there are fewer options. Luckily, there are health foods stores that are dedicated to organic and healthy living in the Southend! One of our favorites is Nature’s Market in Kent. Nature’s Market is unique because it not only brings organic, natural foods to Kent, but it also has been family owned for 41 years! The small and intimate atmosphere helps its customers feel comfortable and well taken care of. From their top quality supplements, organic produce, cosmetics and cleaning supplies, and even the amazing juice bar, you’ll find everything that you need without having to go to a big chain grocery store! Offering over 30,000 products, they really do have it all! We love to shop local, and shopping local organics are even better. You know you will be given the best possible service and advice when you go to Nature’s Market. The owner, Sally, puts all of the employees through an extensive training process. They really go out of their way to make sure that you have the best possible experience. If they don’t have something that you’re looking for, they will even special order it for you. Their fresh pressed juice is another reason to stop by Nature’s Market! Their nutrient packed juices, delicious smoothies, and the daily hot soup is such a fantastic way to get some of that organic health on the go, or enjoy a fresh treat during your shopping experience! 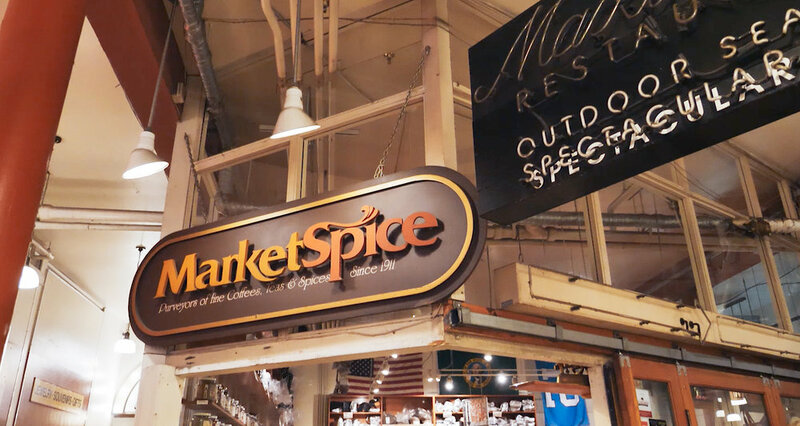 Nature’s Market is also a fantastic place to shop if you are gluten free, or have other special dietary needs. They carry the largest selection of gluten free foods! They carry a wide selections of alternatives to things like pastas, chips, or grains. 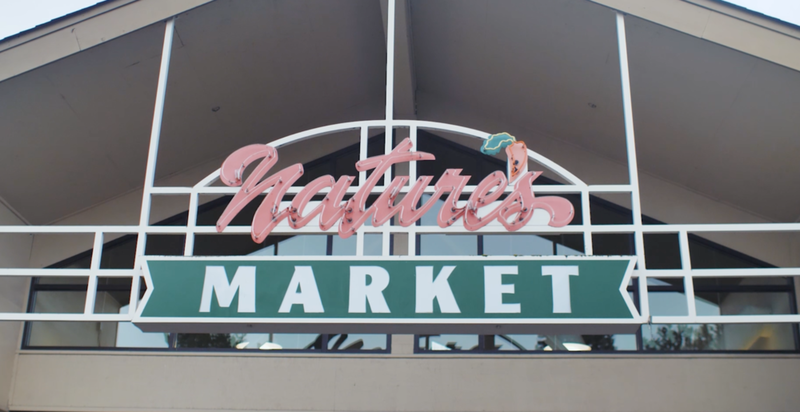 Come check out Nature’s Market today and find out why the South End loves this store so much! How amazing would it be if you could go to a restaurant and enjoy your evening without the hassle of looking at a menu and deciding to order? And what if that experience was not only sustainable and environmentally conscious, but also completely vegan? This is the amazing dinner experience that you can have at Harvest Beat. Located in the Wallingford district of Seattle, this small business provides a unique eating experience. Harvest Beat is here to provide an eating experience that is also going to extreme lengths to be aware of the environment from their dishes to their kitchen. From the moment you walk in to when you finish your desert course, the service and the atmosphere is relaxing, friendly, and community driven. 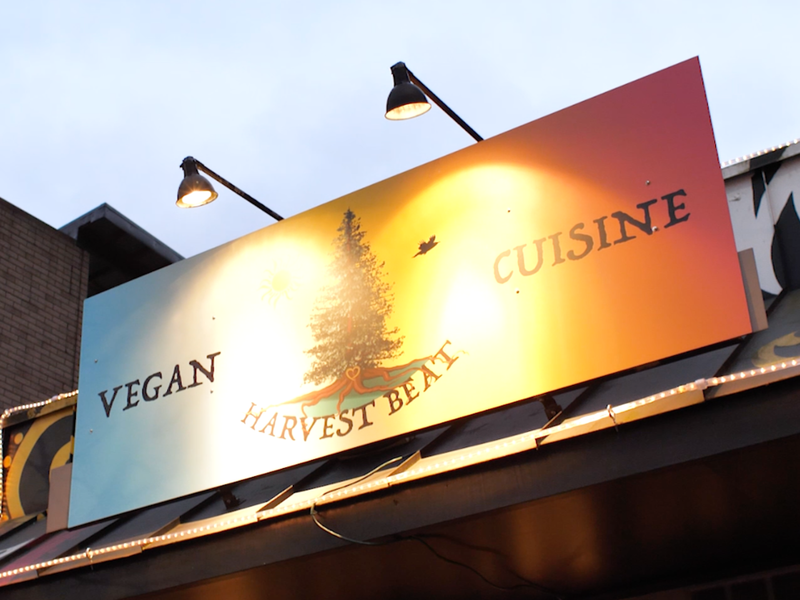 Harvest Beat’s menu is inspired by the change of the seasons. At Harvest Beat, guests can arrive thirty minutes early to enjoy drinks before the official dinner commences. It is such a unique experience to have a restaurant feel, but be seated and served the same meal at the same time. This dining style provides an amazing community atmosphere between the guests as they are all enjoying the same meal together. The dinner begins with a ringing of the gong, and a quick explanation of the meal, and a moment of gratitude toward the farmers that have contributed to the meal. 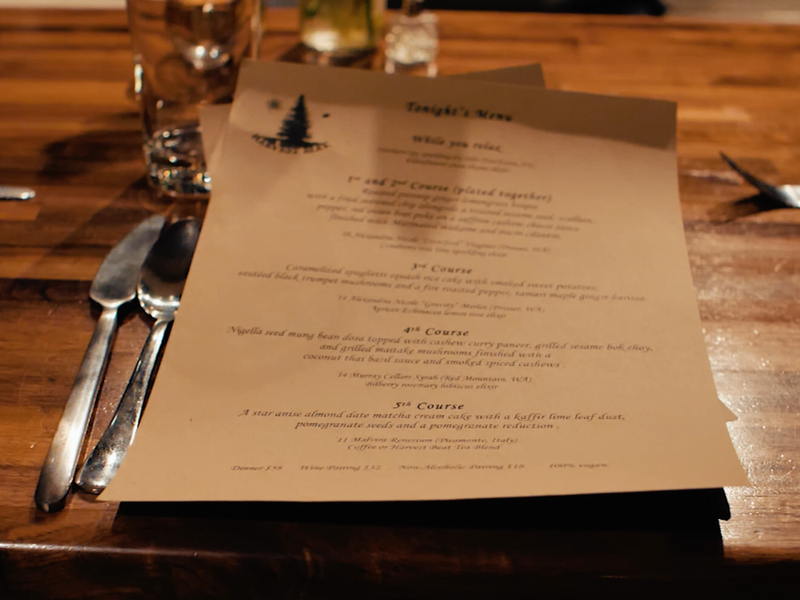 The meal is served in a five course style with a completely seasonal array of foods. Along with each dish, there is the option to choose either an alcoholic or non alcoholic beverage pairing that has been carefully selected with each dish. This 1.5-2 hour experience is filled with artistic plates and unique flavors. We love that Harvest beat uses local organically grown ingredients. It is so important to support local farmers, and the way that Harvest Beat focuses on respecting the earth while showing gratitude for the community and local growers is so inspiring. A restaurant that practices what it preaches so flawlessly makes the whole dinner experience that much more incredible. We love that Harvest Beat can be enjoyed by anyone from meat eaters to children. This community building experience is such a fantastic experience over all and we are so glad that it’s in our own backyard, Seattle! Make your reservations today and enjoy this unique dinner full of creativity, sustainability, and delicious flavors.